Aquarius is often very confident and clever, though sometimes not very emotional. 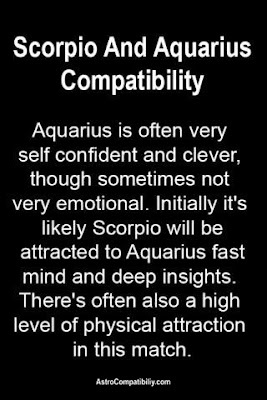 Initially, it's likely Scorpio will be attracted to Aquarius fast mind and deep insights. There's often also a high level of physical attraction in this match. 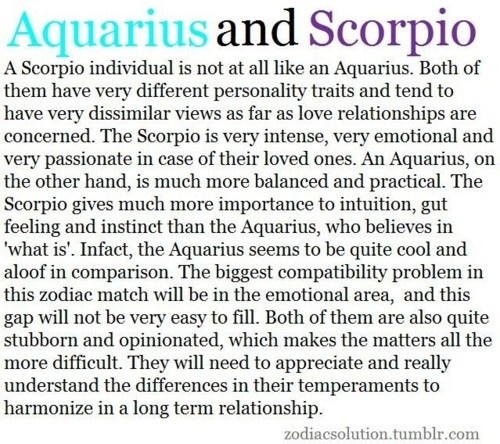 A Scorpio individual is not at all like an Aquarius. Both of them have very different personality traits and tend to have very dissimilar views as far as love relationships are concerned. The Scorpio is very intense, very emotional and very passionate in case of their loved ones. An Aquarius, on the other hand, is much more balanced and practical. 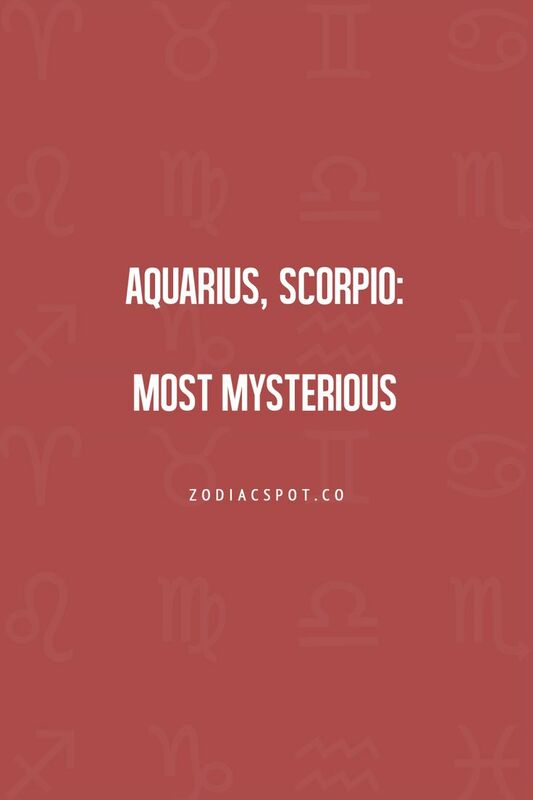 The Scorpio gives much more importance to intuition, gut feeling and instinct than the Aquarius, who believes in 'what is'. In fact, the Aquarius seems to be quite cool and aloof in comparison. The biggest compatibility problem in this zodiac mind will be in the emotional area, and this gap will not be very easy to fill. Both of them are also quite stubborn and opinionated, which makes the matters all the more difficult. They will need to appreciate and really understand the differences in their temperaments to harmonize in a long term relationship. Intrigue and curiosity brings them together, but once they have connected they'll find that there are many areas of disparity. 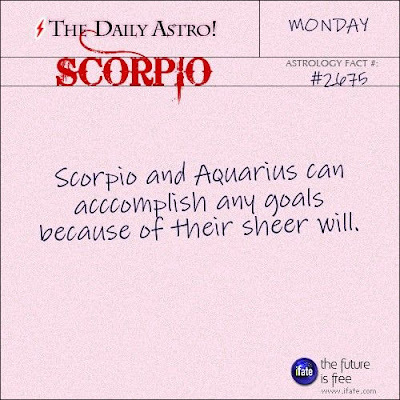 Scorpio is no-nonsense, and Aquarian has more than a few peculiarities. This pair can reach some stellar heights as creative partners, and with supportive placements in their charts, this electric match is worth the gamble. Scorpio and Aquarius can accomplish any goals because of their sheer will. 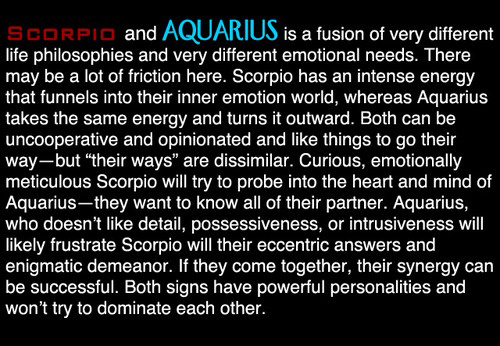 Scorpio and Aquarius is a fusion of very different philosophies and very different emotional needs. There may be a lot of friction here. Scorpio has an intense energy that funnels into their inner emotion world, whereas Aquarius takes the same energy and turns it outward. Both can be uncooperative and opinionated and like things to go their way - but "their ways" are dissimilar. 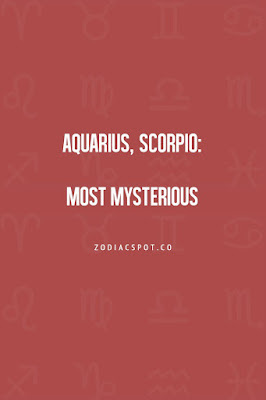 Curious, emotionally meticulous Scorpio will try to probe into the heart and mind of Aquarius - they want to know all of their partner. 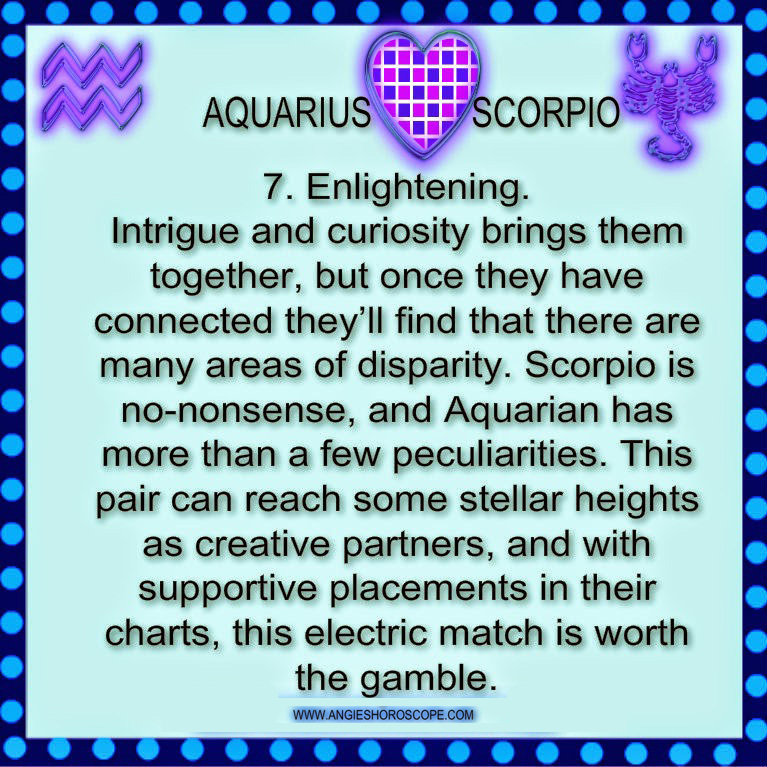 Aquarius who doesn't like detail, possessiveness, or intrusiveness will likely frustrate Scorpio with their eccentric answers and enigmatic demeanor. If they come together, their synergy can be successful. The relationship may have to face a lot of hardships as an Aquarius man is unpredictable and a Scorpio woman is very emotional and demanding. They are very strong and firmly stick to their words. She expects a lot from her partner and if not receiving the same can turn this relationship upside-down. To make this relationship successful, a Scorpio woman has to cool her temperament down and accept the man as he is, without much expectations. 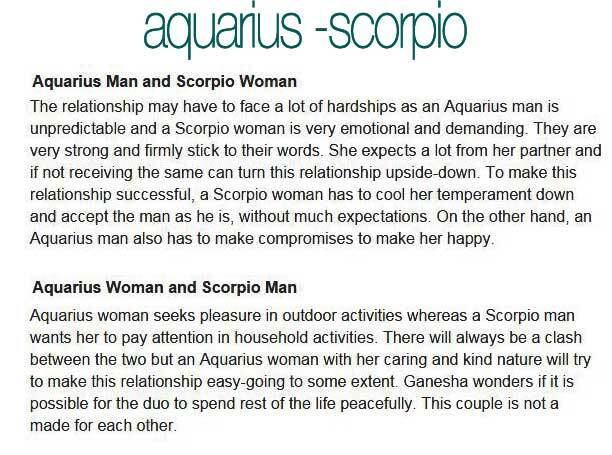 On the other hand, an Aquarius man also has to make compromises to make her happy. 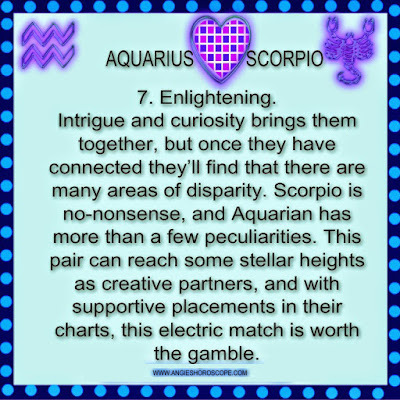 Scorpio and Aquarius is often a hard match to make work. Among other things, communication is likely to be a major issue. 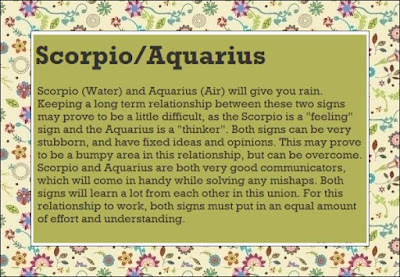 Scorpio (Water) and Aquarius (Air) will give you rain. 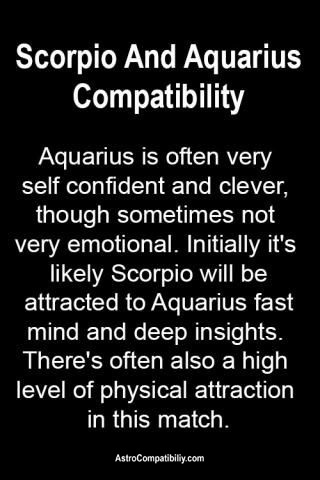 Keeping a long term relationship between these two signs may prove to be a little difficult, as the Scorpio is a "feeling" sign and the Aquarius is a "thinker". Both signs can be very stubborn, and have fixed ideas and opinions. This may prove to be a bumpy area in this relationship, but can be overcome. 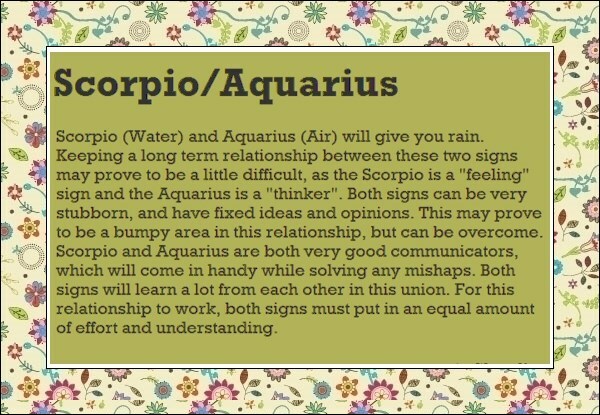 Scorpio and Aquarius are both very good communicators, which will come in handy while solving any mishaps. Both signs will learn a lot from each other in this unions. For this relationship to work, both signs must put in an equal amount of effort and understanding.